ZIONSVILLE, IN. – One Dalmation Molly was found dead in his tank this week, after the owner searched feverishly to find him. He was found in the corner, upside down with his tail pulled into the filter. He leaves behind no siblings or friends. He was the sole survivor of said tank for many months. We’re sure he was greeted with much fish love on “the other side” when he was flushed. “Heaven’s down there?” his owner questioned as Oreo swirled around the bowl. Oreo suffered from a lengthly illness, and was preceded in death by many friends and relatives that once shared his home in The Tank. He held on as long as he could through his sickness to give a family the joy of pet ownership. 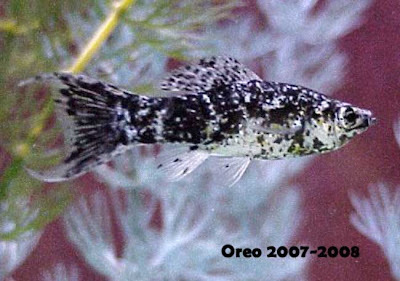 Oreo was a good fish. A dedicated pet to those who loved him. Each morning, he would swim to the front of the tank in anticipation of his tasty TetraColor tropical crisp breakfast. You could see his fins sway with glee as he chased around his meal as it floated within the waters. Oreo spent much of his days gliding through the plants, resting in the rock cave and admiring his reflection. He could even be seen throwing caution to the wind at times, and playing in the fierce rolling bubbles that spew from his scuba diver tank-mate. He was crazy like that sometimes. He was a handsome fish who took pride in his sleek body covered with dabbles of black and white speckles. He will be remembered with a smile, and when Nabisco cookies are being dunked in milk at the table. Cause of death is still not known, but the owners of this tank may be charged with overfeeding, overstocking and glass tapping in excess. Initial findings of problem scales and some furry stuff may be to blame. Investigations are still pending. Be on the lookout for the suspects at your local PetSmart attempting to replace their beloved swimmers again. 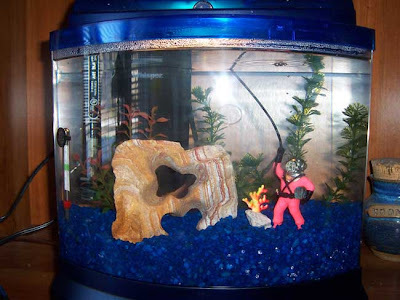 They have assured us the tank has been properly cleaned, disinfected and ready for new pets. They’re confident that Oreo will be guiding them from beyond. Rest In Peace, Oreo. Your home looks so empty, but we'll fill it with more swimming love in a few days. Funeral and burial services were held privately in The Bathroom Down The Hall for the family. RIP Oreo. I never even met you but after reading that heartfelt obituary I feel like I knew you forever. And to echo the words of one young mourner "Heaven's down there???" I'm overcome. He was such a good fish, even though conflicted by his race. I'd shed a tear but fish don't know what crying looks like. It looks normal to them. Do they spew bubbles from their tear ducts? I'm glad he got a burial at sea anyway. Ummmm... hilarity. Thanks for the smile, even on this sad occasion of the death of poor Oreo. Darn those glass tappers! OMG - Andrea, I'm peeing my pants. You def. have a knack for this blogging stuff!! I think that is the best fish obituary I have ever read. I almost shed a tear or two. Perhaps Oreo's owners would enjoy Fish Tycoon? That might be a bit safer for the fish.